Randy Seaver, Descendants of Nathaniel Seaver - 8 Generations, , at http://www.scribd.com/doc/109928508/Descendants-of-Nathaniel-Seaver-8-Generations . (October 2012) , p. 13. Thomas W. Baldwin, Vital Records of Cambridge, Massachusetts, to the year 1850, Boston: Wright & Potter Print. Co., (1914) , Vol. 1, p. 94. Anne Long, Green/Greene Genealogy, Vol.10, , at https://books.google.com/books?id=zYdPAAAAMAAJ . Grangeville, Idaho: (1988-) , p. 24. Deloraine P. Corey, Births, Marriages, and Deaths in the Town of Malden, Massachusetts 1649-1850, Cambridge: University Press, (1903) , p. 347. 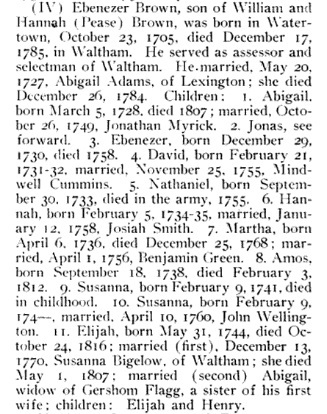 Deloraine P. Corey, Births, Marriages, and Deaths in the Town of Malden, Massachusetts 1649-1850, Cambridge: University Press, (1903) , p. 33. Deloraine P. Corey, Births, Marriages, and Deaths in the Town of Malden, Massachusetts 1649-1850, Cambridge: University Press, (1903) , p. 34. William Richard Cutter, Genealogical and personal memoirs relating to the families of Boston and eastern Massachusetts, New York: Lewis historical Pub. Co., (1908) , vol. 1, p. 238. John A. Schutz, Legislators of the Massachusetts General Court, 1691-1780: a biographical dictionary, , at https://books.google.com/books?id=eKPU-Drsc_UC . Boston: Northeastern University Press, (1997) , p. 201. Randy Seaver, Descendants of Nathaniel Seaver - 8 Generations, , at http://www.scribd.com/doc/109928508/Descendants-of-Nathaniel-Seaver-8-Generations . (October 2012) , p. 20. Randy Seaver, Descendants of Nathaniel Seaver - 8 Generations, , at http://www.scribd.com/doc/109928508/Descendants-of-Nathaniel-Seaver-8-Generations . (October 2012) , p. 21. Elizabeth Browne was born perhaps about 1781. Henry Bond, Genealogies of the Families and Descendants of the Early Settlers of Watertown, Massachusetts, , at https://books.google.com/books?id=_oc6AQAAIAAJ . Boston: Little,Brown & Company, (1855) , p. 127. Eme Browne was born perhaps about 1639.
living at Gilford, Belknap County, New Hampshire. Harrison Colby, A genealogy of the descendants of Abraham Colby and Elizabeth Blaisdell, his wife, who settled in Bow in 1768, , at https://archive.org/details/genealogyofdesce00colb . 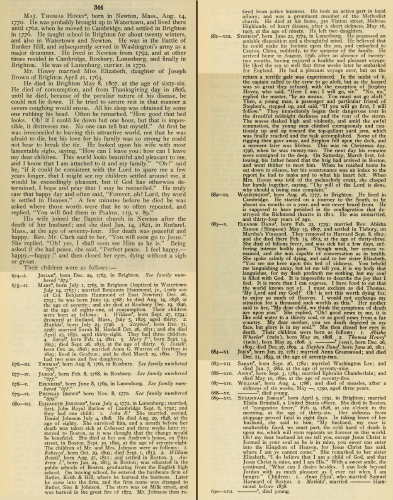 Concord, N.H.: Printed by the Republican Press Association, (1895) Microfilm #896944 of the Family History Library, Salt Lake City, Utah, p. 106. "New Hampshire Marriage Records, 1637-1947," database with images, FamilySearch (https://familysearch.org/ark:/61903/1:1:FLDV-69C : 12 December 2014), Edmund M. Brown and Esther A. Benson, 29 Sep 1861; citing Manchester, Hillsborough, New Hampshire, Bureau of Vital Records and Health Statistics, Concord; FHL microfilm 1,000,967. 1880 United States. Census Office. 10th census, 1880 federal population census, Washington, District of Columbia: National Archives and Records Service, ([19--]) , Census Place: Gilford, Belknap, New Hampshire; Roll: 760; Family History Film: 1254760; Page: 73B; Enumeration District: 006; Image: 0149. "United States Census, 1900," database with images, FamilySearch (https://familysearch.org/ark:/61903/1:1:M3YM-FSV : accessed 19 December 2016), Esther A Brown in household of Emmons M Brown, Gilford Town, Belknap, New Hampshire, United States; citing enumeration district (ED) 5, sheet 6B, family 163, NARA microfilm publication T623 (Washington, D.C.: National Archives and Records Administration, 1972. ); FHL microfilm 1,240,944. Watertown Records, Comprising the first and second books of town proceedings..., Watertown, Mass. : Fred G. Barker, (1890) , Vol. 3, p. 181. Massachusetts Births and Christenings, 1639-1915, at https://www.familysearch.org, Indexing Project (Batch) Number: I00884-0, Source Film Number: 745869, Reference Number: p 309. 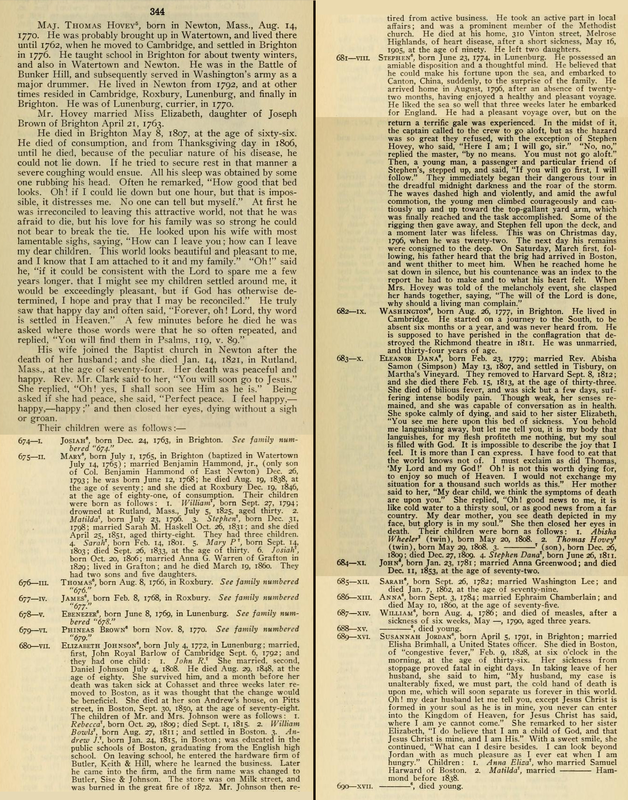 Massachusetts Births and Christenings, 1639-1915, at https://www.familysearch.org, Indexing Project (Batch) Number: I00884-0, Source Film Number: 745869, Reference Number: p 235. Thomas W. Baldwin, Vital records of Reading, Massachusetts, to the year 1850, , at https://archive.org/stream/vitalrecordsofre00inread . Boston, Mass. : Wright & Potter Printing Company, (1912) , p. 501.